There is a groundswell of women in South Africa seeking to give birth naturally after they realise their previous caesarian section may have been unnecessary. It is a feeling inside their bodies, their hearts, their minds that impels them to find a way to give vaginal birth safely. It is the memory of shock, bewilderment, the feeling of having been misled, not informed. 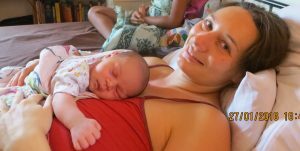 The memory of struggling with abdominal pain after the birth and trying to carry and breastfeed a baby in arms. Some women labour at home and wait until the end of labour before they arrive at the hospital pushing. Some women try and negotiate with the hospital doctors to give them a chance to try for a natural birth. Other women just stay outside the system altogether and give birth alone at home or with friends. Why are these women so desperate to give birth vaginally while obstetricians believe that caesarian section is better? On the other hand, most South Africans cannot afford medical aid and must fall under public health care. The public health service caesarian birth rate is approximately 23%-30%. The reasons for these caesarians (in the public sector) are largely evidence-based and the team-based consultation system manages to protect most mothers from unnecessary caesarians. Yet women in the public sector often face strong coercion, not support, when they seek the chance to give birth vaginally after two or more caesarian sections(VBAMC, VBAC2, VBAC3). Lets remember that emergency caesarian surgery is a lifesaving intervention when the medical need arises in pregnant and laboring women. We want to save lives and prevent harm. We do. Yet, a caesarian section rate of more than 25% may put women at more risk of future harm. Maternal mortality and morbidity increases after each subsequent caesarian section. Caesarian surgery may lead to abdominal adhesions, bladder problems, abdominal and gut problems, interferes with the first contact with the baby, interferes with breastfeeding and has high rates of postnatal depression after the surgery. It also increases the risk of placenta accreta, percreta and increta, life threatening conditions that are associated with uterine surgery. Two new studies show that when caesarean section rates rise towards 10% across a population, the number of maternal and newborn deaths decreases. Yet, when the rate goes above 10%, there is no evidence that mortality rates improve (WHO Statement on Caesarian Section Rates: Executive Summary, April 2015). 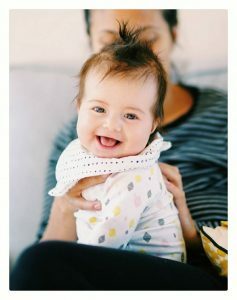 Not all women are satisfied with their experiences of caesarians and many women seek healthier and a more empowering experience of natural vaginal birth after one or more caesarian sections. There is growing information about Vaginal Births After Caesarians (VBAC’s) online, that women now have access to and women are approaching midwives and doctors armed with the knowledge and global statistics on VBAC’s as well as Home Births After Caesarians(HBACs). In fact some women feel so strongly they are declining caesarians and when not supported by doctors and hospitals, give birth at home alone or with friends and birth attendants. The way to prevent VBAC’s and HBACs is to encourage natural physiological births in the first pregnancy. What are the benefits of natural birth for mothers and babies? • Maternal hormones released during labour activate the lactation and bonding process. Constitutional rights apply to women in childbirth and maternity carers should respect, protect and fulfill the full spectrum of pregnant and birthing women’s fundamental human rights (www.humanrightsinchildbirth.org). • Every woman has rights to life and health, including the right to receive safe and accessible health care for the highest attainable level of health in pregnancy, birth, and postpartum. • Every woman has a right to maternity care that respects her fundamental human dignity. • Every woman has a right to privacy and confidentiality. • Every woman has a right to equality and freedom from discrimination. • Every woman has a right to autonomy and respect for her authority over her own body. A woman has the right to choose where to give birth (Home, birth centre, hospital), with whom to give birth (Obstetrician, Midwife, unnassisted), and how to give birth (waterbirth, standing, squatting, lying down, quietly, loudly etc). She has the right to choose caregivers who respect her wishes. She has the right to access medical services should the need arise during the course of pregnancy and labour/birth. Woman-centered care requires a significant shift from hierarchical medical models toward collaborative, complementary care teams in which doctors, nurses and midwives work together to address the needs of each individual woman. Collaborative Teams ensure the best maternal and infant outcomes and should be recognized and rewarded. Both the American College of Obstetricians and Gynaecologists (ACOG) and the Royal College of Obstetricians and Gynaecologists (RCOG) now recommend that women be counselled extensively and not be denied the opportunity for a trial of labour after one or more previous caesarian sections. Women who have been denied access to a trial of labour after 2 or more caesarians sections are often desperate to achieve a natural vaginal birth and not undergo a repeat caesarian. Neither the obstetricians practising in the private health sector nor obstetricians in the public health sector appear to be aware of the evidence in favour of a trial of labour for these women. 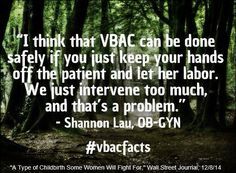 Women seeking a VBAC are therefore obliged to seek the care of someone who is aware of the evidence in favour of a trial of labour after multiple caesarians (VBAMC). This may be outside of the hospital situation. According to the available research, the increased risk of uterine rupture is minimal (Cahill A., 2010; Landon et al, 2006) and women seeking VBAMC should be supported in their efforts. The risks of a repeat multiple caesarian rises exponentially the more caesarians a woman undergoes. After the 3rd caesarian, risks to the mother of a repeat caesarian section increases and effects such as placenta accreta, placenta abruptio, adhesions, hemorrhage after caesarian, uterine rupture during pregnancy, abdominal pain and bowel problems are more likely to occur. Once a mother has given birth vaginally after a caesarian, the risk of harm for the subsequent VBACs decreases. Some women seek VBAC outside of the hospital (HBAC) due to the lack of positive medical support by medical doctors in hospital. This is a system failure. The insistence by medical doctors and midwives on an almost military type precision for the pace and timing of labour (Zhang J., 2010), does not give some VBAC women confidence to engage with the medical system. To labour well, women need warmth, privacy, darkness, the close attention of an experienced, skilled birth attendant (at the least), intermittent monitoring, and importantly, the freedom to adopt upright positions. Women have the right to question interventions that may not be essential, such as an indwelling catheter or being made to lie down or in a semi-reclining position on a hospital bed. Denying access to warm water for pain relief is another example of unnecessary coercion. Ideally, a quiet room close to the hospital (theatre) where a VBAC mother and her chosen midwife can labour without unnecessary interference or anxiety, yet with appropriate monitoring, would provide the safest environment. A recent retrospective study “Planned Home VBAC in the United States, 2004–2009: Outcomes, Maternity Care Practices, and Implications for Shared Decision Making” has been published (Birth: Issues in Perinatal Care, 2015 (Volume 42, Issue 4 December 2015, Pages 299–308) and describes the maternal and neonatal outcomes for women who planned a VBAC at home with midwives (HBAC) who were contributing data to the Midwives Alliance of North America Statistics Project 2.0 cohort during the years 2004–2009. A VBAC outside of the hospital environment needs to be considered carefully by the mothers concerned, as well as by the midwives approached for assistance. Despite being advised to the contrary, some women may still seek to give birth outside of the medical system as they seek complete autonomy and privacy. To ensure the best outcomes for mothers and babies with regard to VBAC’s and HBAC’s, close collaboration between the mother and midwife with the medical disciplines is better than outlawing VBACs and/or HBACs(Cox K., 2015). In the light of the evidence, opportunities for trial of labour after one or more caesarian sections should be provided (2010: Evidence Report: Vaginal Birth After Caesarian: New Insights, AHRQ; 2010: BJOG; Cahill, A.J. ; 2006, Obstet. Gynaecol. Landon M.B.). Neither mothers nor birth attendents should be intimidated, harassed or victimized by medical professionals. Full disclosure and consent, and supportive collaboration, will have better outcomes for all VBAC and HBAC mothers and babies. It would be, in fact, better to prevent that first unnecessary caesarian.